Temperatures from the Rutherglen research station in rural Victoria are one of the 112 weather stations that make-up ACORN-SAT. Temperature have been changed here by Blair Trewin, under the supervision of David Jones at the Bureau. In 2014, Graham Lloyd, Environmental Reporter at The Australian, quoting me, explained how a cooling trend in the minimum temperature record at Rutherglen had been changed into a warming trend by progressively reducing temperatures from 1973 back to 1913. For the year 1913, there was a large difference of 1.7 degrees Celsius between the mean annual minimum temperature, as measured at Rutherglen using standard equipment at this official weather station, and the remodelled ACORN-SAT Version 1 temperature. The Bureau responded to Lloyd, claiming that the changes were necessary because the weather recording equipment had been moved between paddocks. This is not a logical explanation in the flat local terrain, and furthermore the official ACORN-SAT catalogue clearly states that there has never been a site move. Australians might nevertheless want to give the Bureau the benefit of the doubt and let them make a single set of apparently necessary changes. But now, just six years later, the Bureau has again changed the temperature record for Rutherglen. In Version 2 of ACORN-SAT for Rutherglen, the minimum temperatures as recorded in the early 1900s, have been further reduced, making the present appear even warmer relative to the past. The warming trend is now 1.9 degrees Celsius per century. The Bureau has also variously claimed that they need to cool that past at Rutherglen to make the temperature trend more consistent with trends at neighbouring locations. But this claim is not supported by the evidence. For example, the raw data at the nearby towns of Deniliquin, Echuca and Benalla also show cooling. The consistent cooling in the minimum temperatures is associated with land-use change in this region: specifically, the staged introduction of irrigation. Australians trust the Bureau of Meteorology as our official source of weather information, wisdom and advice. So, we are entitled to ask the Bureau to explain: If the statements provided to date do not justify changing historic temperature records, what are the scientifically valid reasons for doing so? The changes made to ACORN-SAT Version 2 begin with changes to the daily temperatures. For example, on the first day of temperature recordings at Rutherglen, 8 November 1912, the measured minimum temperature is 10.6 degrees Celsius. This measurement is changed to 7.6 degrees Celsius in ACORN-SAT Version 1. In Version 2, the already remodeled value is changed again, to 7.4 degrees Celsius – applying a further cooling of 0.2 degrees Celsius. Considering historically significant events, for example temperatures at Rutherglen during the January 1939 bushfires that devastated large areas of Victoria, the changes made to the historical record are even more significant. The minimum temperature on the hottest day was measured as 28.3 degrees Celsius at the Rutherglen Research Station. This value was changed to 27.8 degrees Celsius in ACORN Version 1, a reduction of 0.5 degrees Celsius. In Version 2, the temperature is reduced by a further 2.6 degrees Celsius, producing a temperature of 25.7 degrees Celsius. This type of remodelling will potentially have implications for understanding the relationship between past temperatures and bushfire behavior. Of course, changing the data in this way will also affect analysis of climate variability and change into the future. By reducing past temperature, there is potential for new record hottest days for the same weather. Annual average minimum temperatures at Rutherglen (1913 to 2017). Raw temperatures (green) show a mild cooling trend of 0.28 degrees Celsius per 100 years. 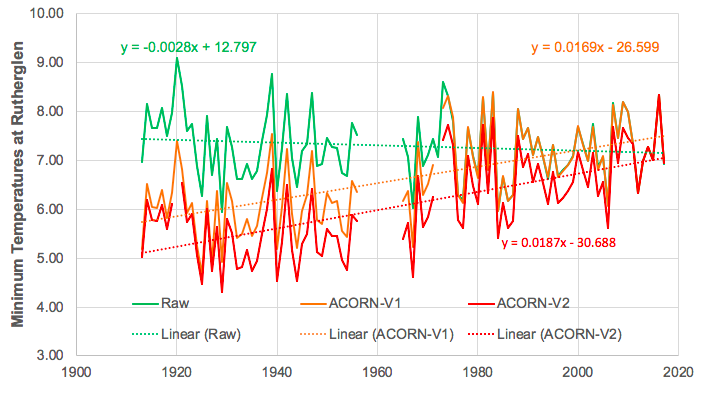 This cooling trend has been changed to warming of 1.7 degrees Celsius per 100 years in ACORN-SAT Version 1 (orange). These temperatures have been further remodeled in ACORN-SAT Version 1 (red) to give even more dramatic warming, which is now 1.9 degrees Celsius.